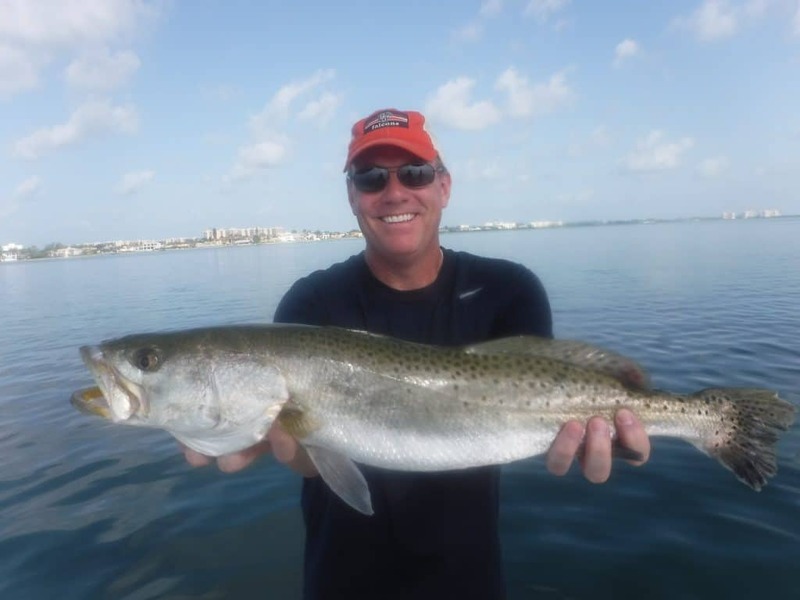 Anglers taking out Longboat Key fishing charters can experience great action all year long. Longboat Key is eleven miles long and is just north of Lido Key. It is a bit quieter than some of the other keys but has some great accommodations and restaurants. It also offers some great fishing! 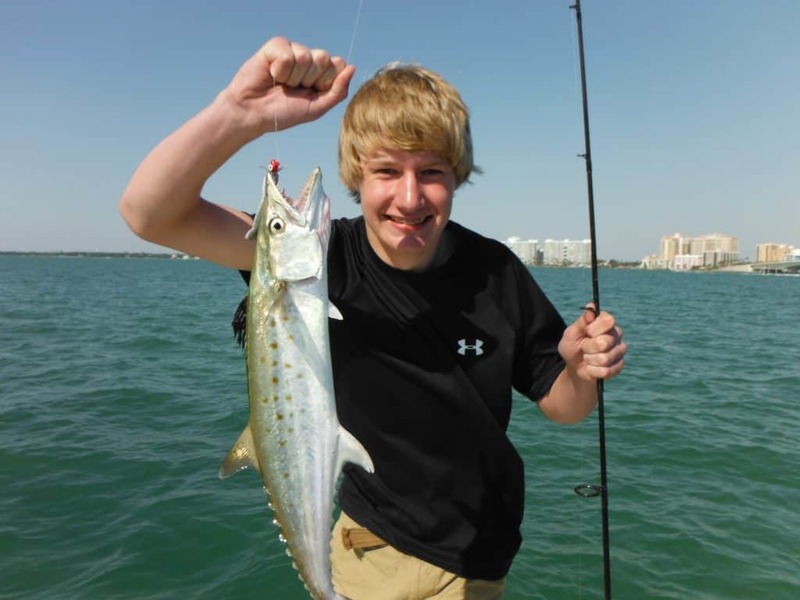 Longboat Key offers good fishing all year long for a number of species. The entire east side of Longboat Key has lush grass flats that hold a wide variety of fish species all year long. Residential canals offer refuge in cold weather. New Pass to the south and Longboat Pass to the north are fish highways, connecting Sarasota Bay to the Gulf of Mexico. 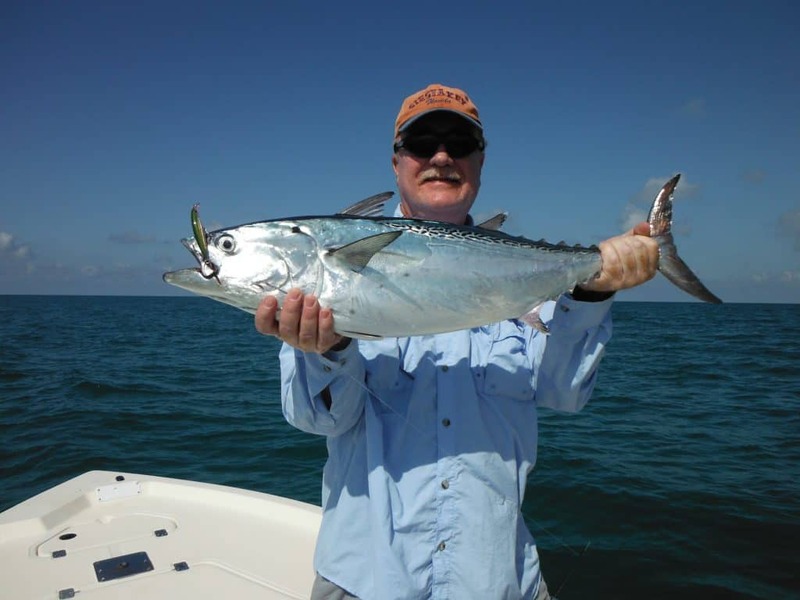 The beaches off of Longboat Key provide fantastic fishing for both boat and shore anglers. I use light spinning tackle on my Longboat Key fishing charters. It is the best choice for most anglers. Ten pound spinning outfits allow anglers to cast light lures and baits and fish all morning comfortably. They are also light enough for kids to handle. The deep grass flats off of Longboat Key in Sarasota Bay offer some of the best fishing in the area. 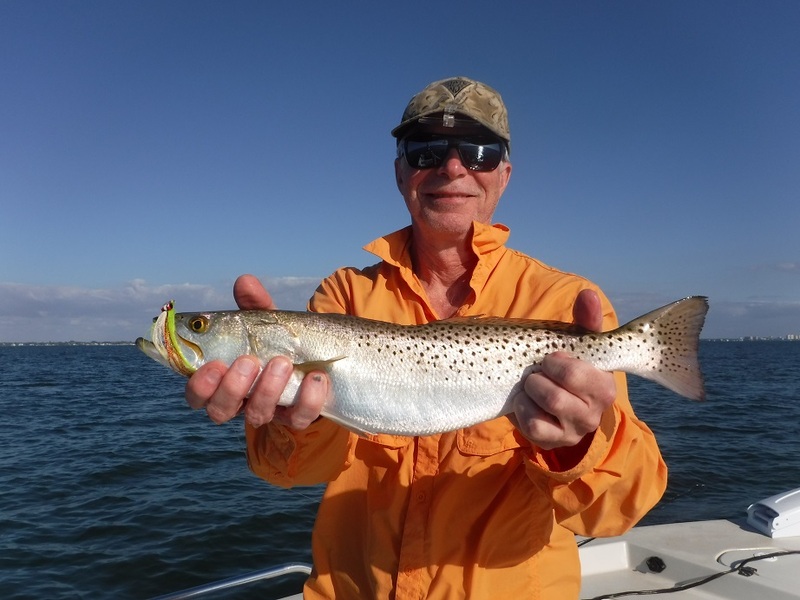 The Middlegrounds, Country Club Shores, Bishop’s Pt, Buttonwood, Long Bar, and Whale Key are all legendary spots for speckled trout and other species. Along with trout, Spanish mackerel, bluefish, pompano, snapper, grouper, jack crevelle, sharks, cobia, ladyfish, and other species a re landed. Drifting the deep grass flats is a very productive method. The majority of fish caught on my Sarasota fishing charters are caught employing this technique. It really is fairly uncomplicated, though there are nuances, as in all fishing. I position my boat upwind and up-tide of the flat I want to fish. Then, I let the wind and tide push the boat across the flat. Anglers cast lures and live bait as we drift the flat. The most effective lure is a lead head jig with a soft plastic tail. One quarter ounce jigs work well with a 3” or 4” body. Shad tail, paddle tail, and shrimp bodies are the most popular baits. Colors vary; every angler has his or her favorite. I prefer glow, new penny, and red/gold, but many other colors work fine. Presentation and location are the more important factors. The jig is cast out and allowed to sink several feet. It is then retrieved back to the boat using sharp twitches. Jigs allow anglers to cover a lot of water. They also catch a lot of fish! Other artificial lures can be used with success. Silver spoons cast a long way and are great bait fish imitations. Plugs are effective as well, though the treble hooks can be an issue; they can damage fish that are to be released. Live bait certainly works well on the deep grass flats. A live shrimp is without question the top live bait. Shrimp catch every fish species that swims. Live shrimp can be “free lined” on the deeper flats. That means the shrimp id hooked and allowed to swim without any weight. Anglers fishing water that is five feet or shallower will often times need a float to suspend the shrimp up off the bottom. A “popping cork” is widely used here in Sarasota Bay. It keeps the shrimp out of the grass, provides casting weight, and indicated when a fish takes the bait. Shallow bars and flats all along the east side of Longboat Key hold snook, redfish, and jacks. Fishing these shallow flats can be a bit more challenging. Fish are spooky in water less than three feet deep. Tactics and baits need to change as well to avoid hanging up. Topwater baits are an obvious choice for anglers fishing shallow. They float on the surface and their erratic action irritates and excites game fish, eliciting a strike. Weedless spoons are a great choice and are a proven redfish bait. These baits can be cast a long distance and run in water as shallow as a foot deep. Spoons are great locator baits as anglers can cover a lot of water in short order. Soft plastic baits are extremely effective in shallow water as well. Light jig heads can be used when grass is on the sparse side. Weighted, weedless swim bait hooks work great when the grass is a bit thicker. Tides are very important in Saltwater fishing. Tides will position and locate fish. Many anglers prefer an incoming tide when flats fishing. I personally don’t care, as long as the water is moving. Tides are crucial when fishing shallow. Low tides will concentrate fish in deeper water. Fish will scatter out on a flat when the tide is high. There are countless residential canals along the east side of Longboat Key, including the Rim Canal, which runs the length of the key. The water is generally fairly deep, by Florida standards. Docks provide cover and forage. Fish will move into these canals when the water gets cold on the open flats. Snook, redfish, black drum, flounder, sheepshead, snapper and other species are caught in these areas. The best approach when fishing docks and canals is to fish live shrimp near and under structure. A large, live shrimp is seldom refused. Anglers will also catch fish casting artificial lures along mangrove shorelines and near docks. Rapala X-Raps and jigs work best. 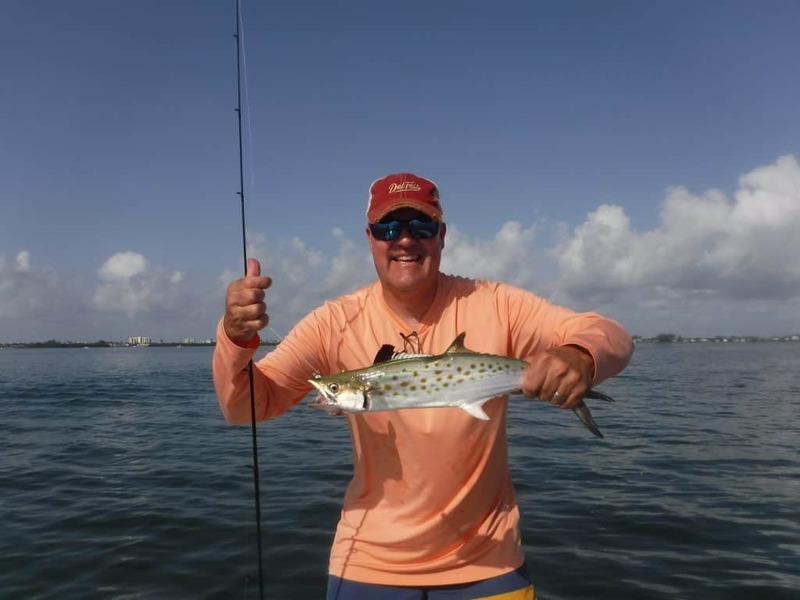 New Pass and Longboat Pass are great spots to fish, especially in the spring and fall. Both passes are also accessible to anglers without a boat. Pompano will stage in the passes and feed. 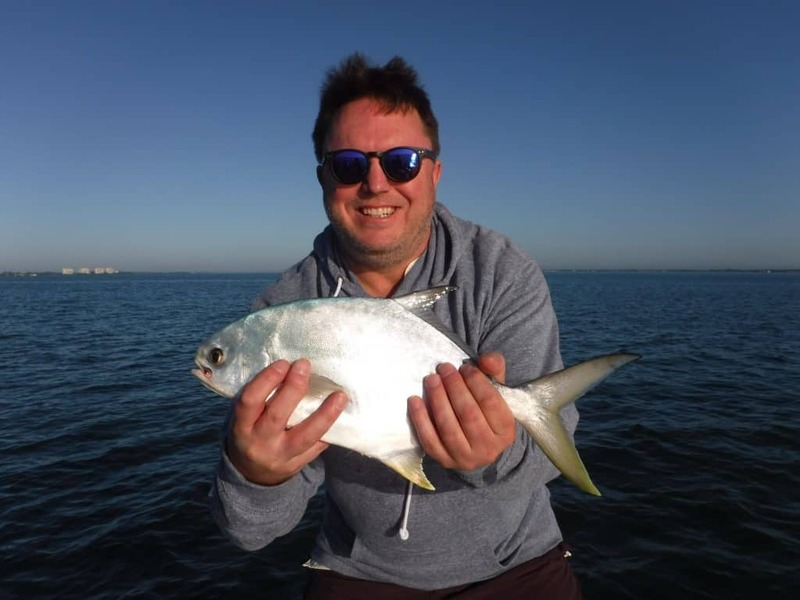 The best pompano bait is a small jig with short dressing. These are specially made for pompano and their small mouths. Bouncing these jigs along the bottom will fool them. Spanish mackerel, bluefish, and ladyfish will school up thick in the passes and feed heavily. Artificial lures such as jigs and plugs will do well on these actively feeding fish. Trolling can be a good strategy to locate fish in the passes. Free lining live bait or hooking them on a jig head and bouncing them off the bottom will produce as well. Structure in both New Pass and Longboat Pass will attract a lot of fish. This structure included the two bridges, numerous docks, and shoreline rip rap. 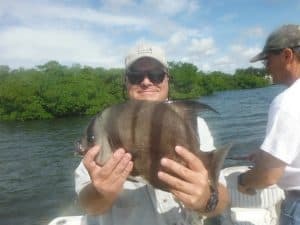 Sheepshead will gang up in huge schools from January through April. Mangrove snapper are available all year. Live shrimp works best for these tasty bottom feeding saltwater pan fish. Snook will be located in the passes as well in the summer. They will move out of the flats and out into the passes on their way out to the beaches to spawn. Some of the largest snook of the year are caught by anglers fishing live bait fish near structure in the passes. Action in the Gulf of Mexico just off of the Longboat Key beaches can be nothing short of fantastic when conditions are good. Light east winds will result in calm seas and clear water. This will attract both bait fish and in turn, game fish. Spanish mackerel, false albacore, sharks, and cobia are caught in the spring and fall. Tarpon are available in summer. Bottom fish are taken off of the nearshore artificial reefs all year. Casting to “breaking” mackerel and false albacore is a favorite fishing charter! Fish are seen actively feeding on the helpless bait fish. Fish are literally jumping out of the water. Birds are diving, it is great fun! Anglers cast lures into the melee and an instant hook-up is almost always the result. Spoons, jigs, and plugs all produce, but honestly, just about any bait that is close to the right size will get bit. The approach is pretty simple. I just run out one of the passes and start looking for fish. The three reefs off of Lido Key are always a good place to start as they hold a bunch of bait. Point of Rocks is another good spot, as is Whitney Beach rocks on the north end of Longboat Key. Birds wheeling and diving are always a great sign. Once fish are spotted, I ease the boat into position. Trolling is a great way to locate fish when they are not showing on the surface. Spoons and plugs being trolled behind the boat using either planers or weights will find the fish. Once located, anglers can then cast to them. This is one situation where free lining live bait is a good option. This is a great opportunity for clients who fly fish to experience world class action! False albacore are incredible sport on a 9wt fly rod. Anglers targeting Spanish mackerel will do well using a 7wt outfit. Small while bait fish imitations are the best flies to use. Giant tarpon show up off of the Longboat Key beaches in May. This is truly big game fishing. It is a charter best suited for more experienced anglers. It is a lot like hunting and patience is required. There will be days when no tarpon are hooked. But, when it all comes together, it is incredible! I get my clients out on the beach just before first light. We sit there about a hundred yards offshore and look for pods of tarpon moving through. I then position the boat so that my anglers can cast out if front of them. We use heavy spinning tackle and live crabs or bait fish such as pin fish and sardines. There are three artificial reefs just off of New Pass at the south end of Longboat Key. These hold fish all year long. Bottom fishing for snapper and sheepshead is easy and a great option for novice anglers and children. It is as simple as dropping a shrimp down to the bottom. Spanish mackerel and false albacore will also school there, attracted to the large schools of bait. 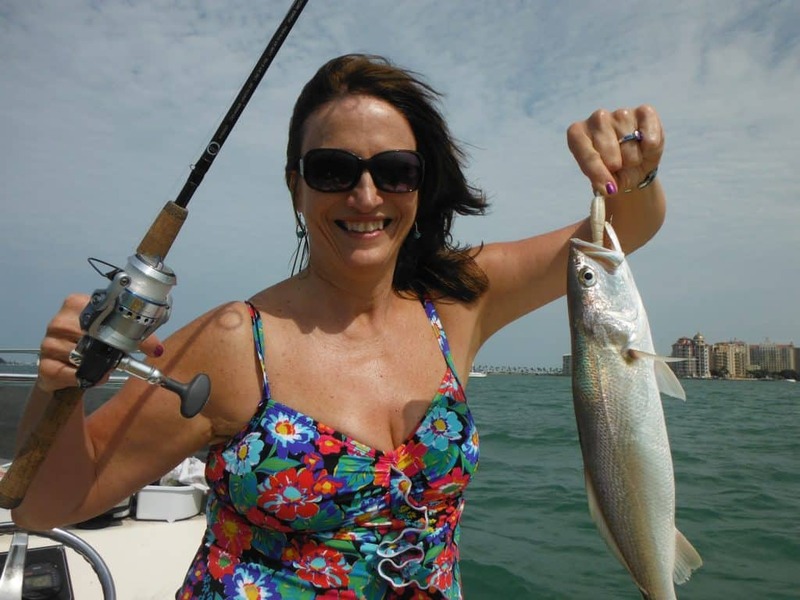 Q: Do guests on Longboat Key fishing charters need a license? A: No. Florida has a provision where anglers going out on paid charters with a professional, licensed fishing captain. This is a very convenient feature as it saves clients the time and inconvenience of having to purchase a Florida saltwater fishing license. However, visitors who want to fish on their own, even from shore, will need to obtain one. The FWC makes this easy to do. HERE is a link to the FWC website, where anglers can purchase a license. Q: Where do clients going out on Longboat Key fishing charters meet? A: I meet most of my clients at the boat ramp on Ken Thompson Parkway. There is ample parking, a nice restroom, and docks for easy loading and unloading. It is also very centrally located as it puts us right in the heart of the prime fishing grounds with very little idle time. Occasionally clients will be picked up at alternate locations such as their condo dock. 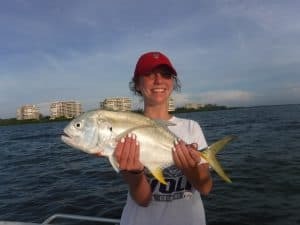 Q: What kind of fish are caught on Longboat Key fishing charters and can clients keep fish to eat? A: Clients are likely to catch six to eight different fish species on a four hour trip. 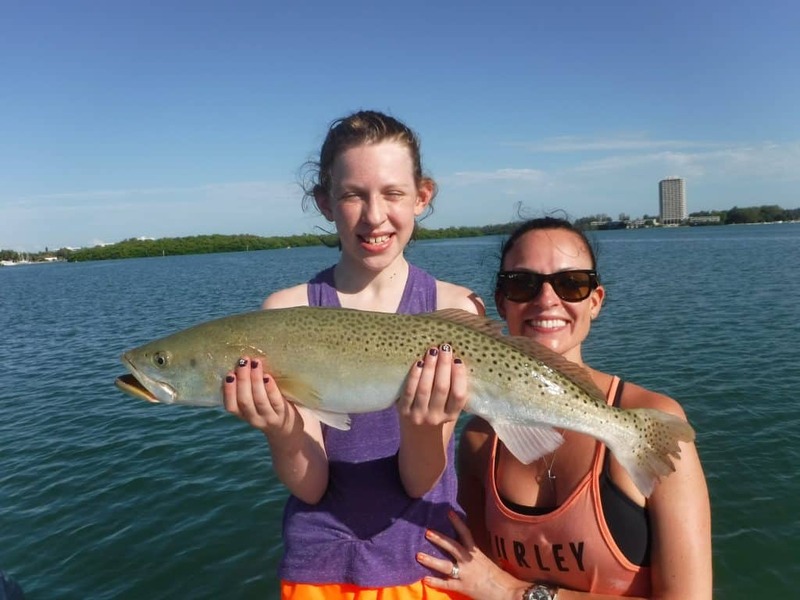 Sarasota Bay and the Gulf of Mexico offer anglers the chance to catch many different species. 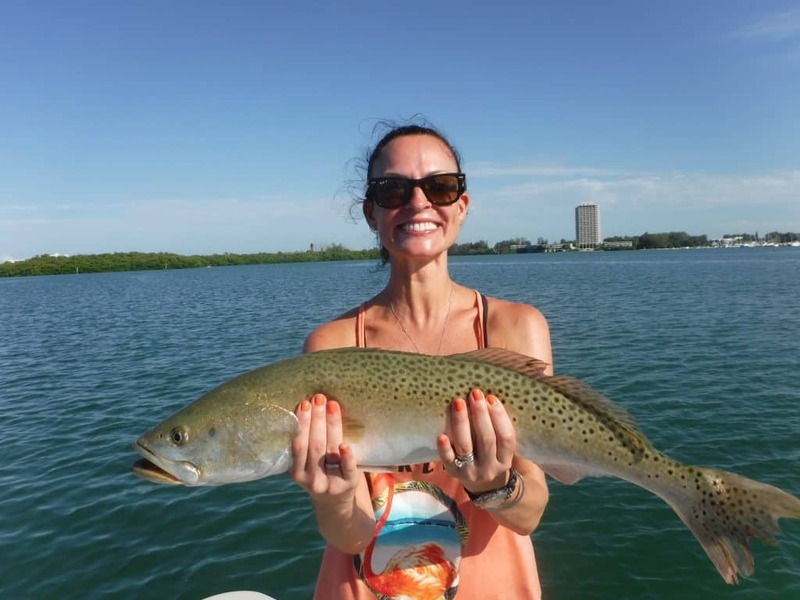 Speckled trout, snook, redfish, jack crevelle, Spanish mackerel, flounder, snapper, grouper, drum, sea bass, pompano, bluefish, cobia, sharks, tarpon, ladyfish, and catfish are commonly caught by anglers on Longboat Key fishing charters. While I am proponent of catch and release, I certainly don’t mind if clients keep a couple of fish for a meal. I will fillet and bag them at the end of the charter. Q: How much does a fishing charter cost and what does it include? A: A four hour fishing charter for one to four anglers is $400. Four hours is plenty for most anglers. More experienced clients may choose a six hour trip, that cost is $550. Fishing charters include all bait and tackle for the charter. While I supply all rods and reels, customers may certainly bring along their favorite rod along. A cooler with ice is also provided, as is a fishing license for all guests. Clients should bring whatever they want to eat and drink, hats, sunglasses, sunscreen, comfortable shoes, and appropriate clothing. Sarasota freshwater fishing is an underutilized and overlooked resource for visiting anglers. Saltwater fishing gets the bulk of the attention in Sarasota. Very good freshwater fishing can be experienced in several watersheds close to Sarasota and her beaches. The three primary freshwater systems are the Myakka River, Braden River, and Manatee River watersheds. All three are similar in a couple of ways. Small rivers flow into damned lakes. These portions are entirely freshwater. The water is brackish below the dams. Brackish rivers hold both freshwater and saltwater species. Lake Manatee lies in Manatee County about 10 miles east of I-75 on SR 64. There are two access points the Lake Manatee for boating anglers. Lake Manatee State Park has a surfaced ramp and great facilities and is near the dam. There is also an unimproved ramp at the State Road 64 bridge several miles upstream from the dam. Lake Manatee supplies to drinking water for much of Sarasota and Manatee County. Water levels in lake Manatee are controlled by the dam. The State Road 64 bridge is a natural divider in Lake Manatee the portion east of the bridge has a river like feel to it. It is narrower with a deep winding channel. Lake Manatee Fish Camp is on the dirt road leading to the landing. Anglers can purchase bait, drinks, and snacks there. The main lake lies between the State Road 64 bridge and the dam. Lake Manatee is similar to a northern lake. It is deeper than most Florida lakes, reaching 50 feet in several places. It also has a distinct river channel, which is the main structure in the lake. Lake Manatee offers very good fishing for bass, bream, and catfish. There are some very large catfish in lake Manatee. Crappie, also known as speckled perch, are probably the most sought after species in lake Manatee. Sunshine bass are stocked there as well. These are a striped bass and white bass hybrid. Northern anglers will recognize them as wipers or hybrids. It is basically the same species. Anglers fishing the Manatee River down stream from the dam can launch boats and rent canoes and kayaks at Ray’s Canoe Hideaway. There is also a nice ramp and park with facilities at Ft. Hamer. This is a very nice park adjacent to the new bridge crossing the river. Most of the freshwater fishing will be east, or up-river, from Ft. Hamer. Upper Myakka Lake lies totally within the boundaries of Myakka River State Park. It is in Sarasota County 7 miles east of I-75 on State Road 72. This lake as much more typical of Florida lakes. A small, shallow river feeds the lake. The water is held back by a simple weir dam. Water then flows down a narrow river to lower Myakka Lake. The lower lake can only be accessed by foot or by River. It is very shallow and weedy. There is another small weir dam which stops tidal water from entering the system. Fishing is good in both the lakes and connecting river. The river between the two lakes gets very little pressure and offers good fishing for kayak anglers. Upper Myakka Lake has a very good population of bass some of them quite large. It also has a very good population of bluegill, stump knocker, catfish, and crappie.The lake is very weedy and shallow, with the deepest portion being about 5 feet deep. The best fishing is generally when the water levels are up. Fishing can be tough in the winter during the drought when the water is low. A surfaced ramp exist on the lake inside the State Park. The Braden River is the most convenient to Sarasota. It lies west of I-75 just off State Road 70. There is a very nice boat ramp along with a bait and snack store, canoe rentals, and even cabin rentals. The Braden River flows into Lake Evers. This lake has a uniform depth of around 20 feet with very little structure on the bottom. Bass, bluegill, and crappie are the primary species. Access to the lake and river is from the park at Jiggs Landing. 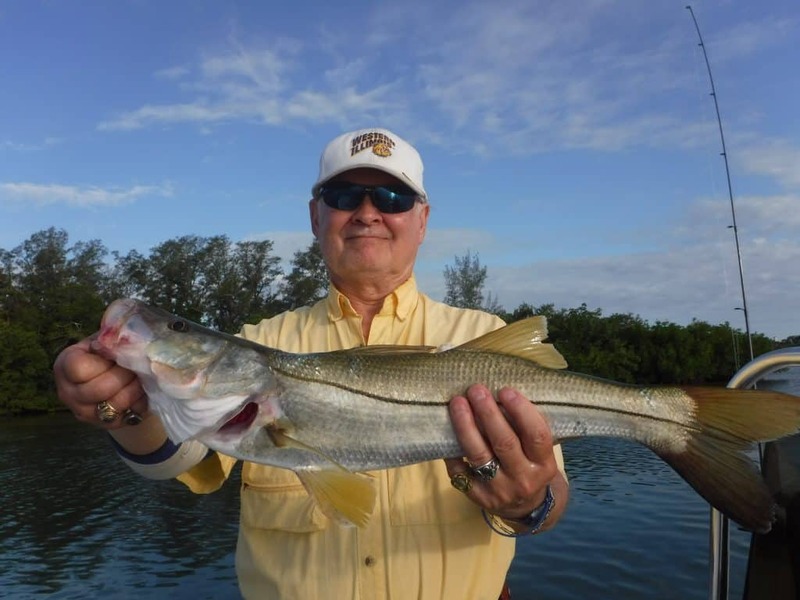 All three rivers offer anglers the chance to catch snook in the cooler months. While snook are saltwater fish, they can survive quite well and absolute freshwater. 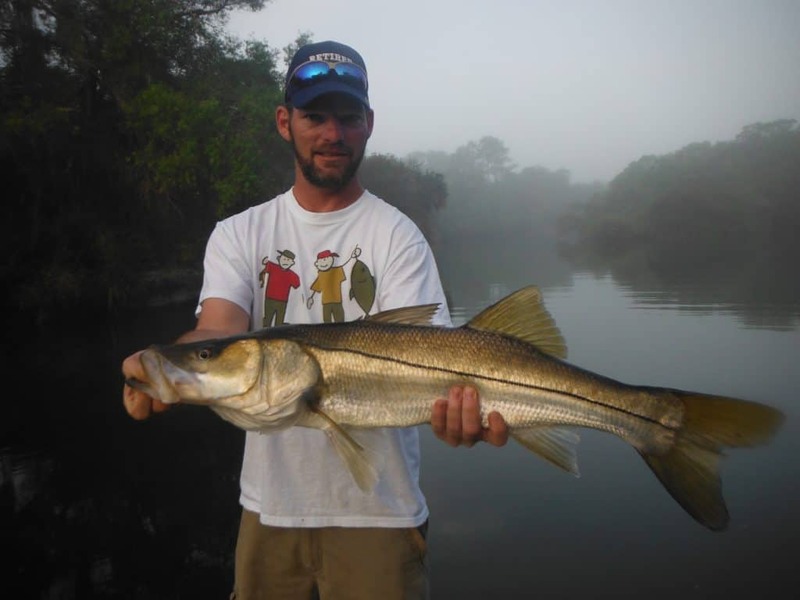 Snook move up into these rivers to find warmer water and forage when it gets cold. The Myakka and Manatee rivers are brackish below the dam, while the Braden is pure salt water. Ponds are abundant and offer Sarasota freshwater fishing. Many housing developments have retention ponds. These are areas designed to catch excess rainfall. Almost all of them have bass and bluegill in them. Many are private, but there are also a lot of public ponds, particularly in Lakewood Ranch. These are a great option for anglers without a boat, kayak, or canoe. I really enjoy Sarasota freshwater fishing for panfish (AKA bream). It might sound odd that being a full-time fishing guide, that I would spend my time fishing for these little guys. However, I find it very relaxing and enjoyable. They are also fabulous eating! Florida is blessed with many different pan fish species. Bluegill, shallow cracker, stump knocker, war mouth, along with crappie are caught by anglers using ultralight tackle. Personally, I prefer to fish for bream with artificial lures. My go to lure is a 1/16 ounce black Beetlespin. I have caught just about every freshwater species using this little lure! Small jigs are also extremely effective. A tiny chartreuse curly tail jig on a 1/16 ounce jig head is deadly on bream and small bass. It mimics the small bait fish that are in most Florida lakes. Tiny plugs can also be effective, especially for anglers targeting the larger specimens. Live bait certainly catches plenty of bream. Crickets and red wigglers are the two top live baits for anglers Sarasota freshwater fishing. They are most often fished a couple feet under a small float. This is as basic as fishing gets. Ultralight spinning or spend cast tackle with 4 to 6 pound line works great. Cane poles still have their place in freshwater, and have accounted for many a fish dinner. Catching bream is not very complicated. The key to success is moving around until a school of fish is located. Shoreline cover, especially with fallen trees, are prime spots. Edges of weed beds are also great places to look for panfish. Anglers can cast small artificial lures or live baits towards the spots. When using artificial lures, a slow steady retrieve is preferred. Do not get to aggressive, it will spook the fish. Trolling is also an extremely successful technique when searching out panfish. Crappie in particular are targeted using this method. I like to slowly troll the edge of a weed line for bluegill and stumpknocker. I use two rods, one with a jig on one rod and a Beetlespin on the other. If bluegill are around, this will usually find them. 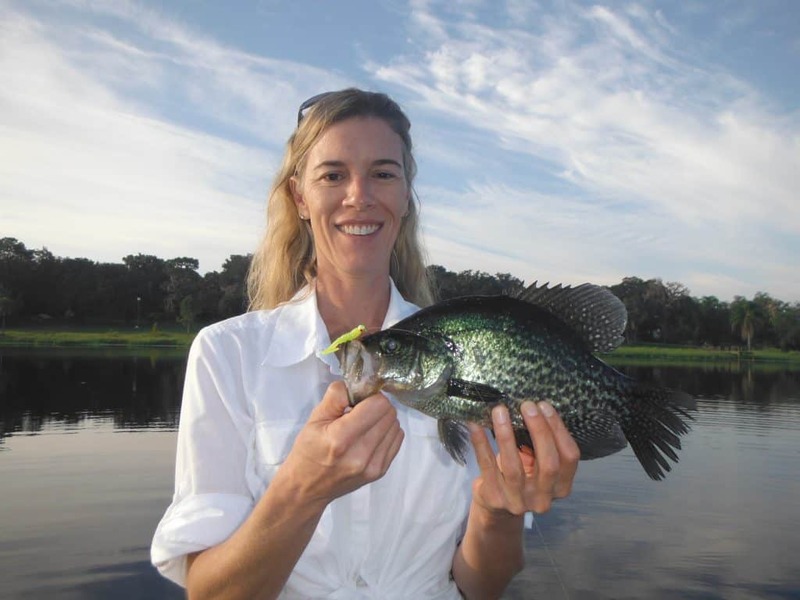 Trolling for crappie, especially in Lake Manatee where it is deeper, is a bit more technical. One of the best lures is a Blakemore Road Runner. This is a small jig with a spinner attached to it. Bright colors produce best in the dark Lake Manatee water. The most productive technique is to slowly troll back and forth over the edges of the submerged river channel. Crappie will school up on these edges. Once a school is located, the action can be fast and furious! While fishing for bream is fun and puts fillets on the table, there is little doubt that the largemouth bass is king of freshwater. Florida is famous and well-known for its giant largemouth bass. Sarasota has some very good bass fishing, however it is not well-known for the giant bass. Lake Manatee and Myakka Lake have good populations of one pound to 5 pound largemouth. However 10 pound bass are not common, by any means. Many different techniques and lures will produce largemouth bass when Sarasota freshwater fishing. Soft plastic baits are extremely productive and are probably the most popular artificial lures for bass. Every angler has his or her favorite soft plastic, but all will catch fish if presented properly. I personally prefer the Senko worms. Lighter colors such as watermelon work in clear water and darker colors such as golden bream are better in dark water. Soft plastic baits can be rigged several different ways. In shallow water can be rigged without any weight on a weedless hook. The wacky warm hook works really well with these finesse baits. At times a heavier weight will be required. Deeper water and punching through heavy vegetation will require a 1/2 ounce to 1 ounce sinker. Top water plugs are great fun to fish and will elicit some exciting strikes! Again, angler preferences will very, but I prefer the Rapala Prop R. It has a bullet nose with a propeller on the rear. It produces great action and commotion. Poppers such as the Chug Bug are very effective, as are walk the dog baits such as the Zara Spook. Shallow diving plugs such as the Rapala X-Rap work very well, too. Spinnerbaits catch a lot of bass! They are easy to use and work well through moderate amounts of vegetation. White is a very good color in the tannin stained waters. They are versatile, productive, and easy for novice anglers Sarasota bass fishing. 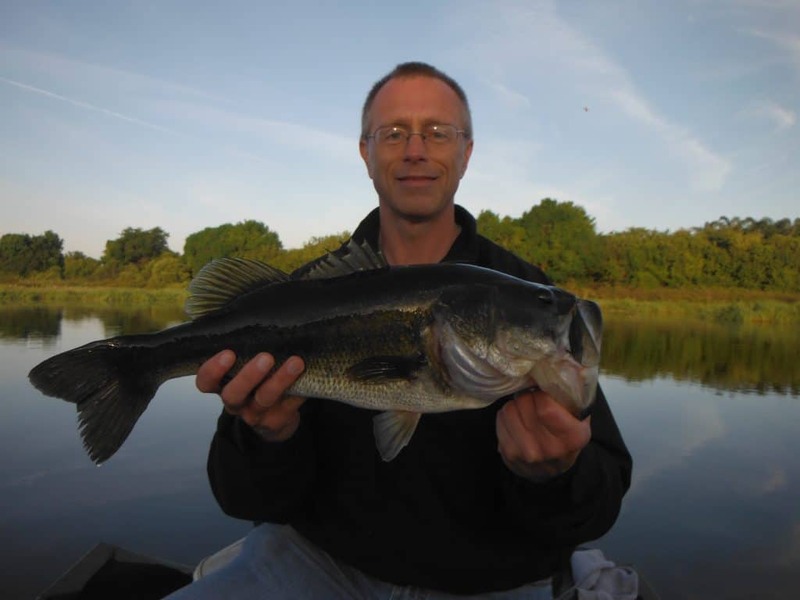 While I don’t use live bait very often for largemouth bass, that is just a personal preference. 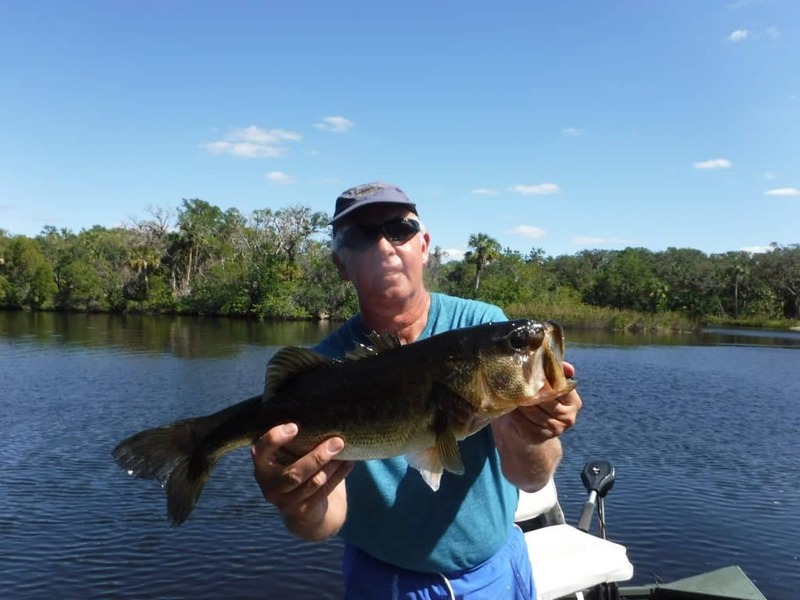 More large bass are landed in Florida using live shiners that all other baits combined. Heavier tackle is required as a ten inch shiner cast into heavy vegetation may fool a trophy bass. Nightcrawlers are also very effective. The best approach is to use a number one hook, and hook the worm in the front using no weight. This will let it swim seductively and naturally in the water. While snook are technically a saltwater species, they can live in true fresh water. Snook are one of the few fish species that migrate into fresh water for reasons other than to spawn. They do so to escape the temperature extremes of the saltwater flats. River water is darker, deeper, and therefore warmer. Forage is plentiful in rivers as well. Snook are ambush predators, just like bass. They will take up residence in spots that provide cover and a break from the current. Outside bends in the river with some cover such as fallen trees are high percentage spots. Lures that trigger strikes and cover a lot of water work best. I have found shallow diving plugs to be the best all around lures for river snook fishing. Tides are a factor in both the Myakka and Manatee Rivers. Anglers not accustomed to dealing with tides will have to learn how they affect the fishing. This is particularly true in the cooler months when the water levels are low. High, falling tides are best as they create a nice current. Anglers fishing the Myakka River can use El Jobean tides and add two hours. Manatee River anglers use Redfish Pt. and add one hour. Catfish are another popular species targeted by anglers Sarasota freshwater fishing. Lake Manatee has an excellent population of large catfish. 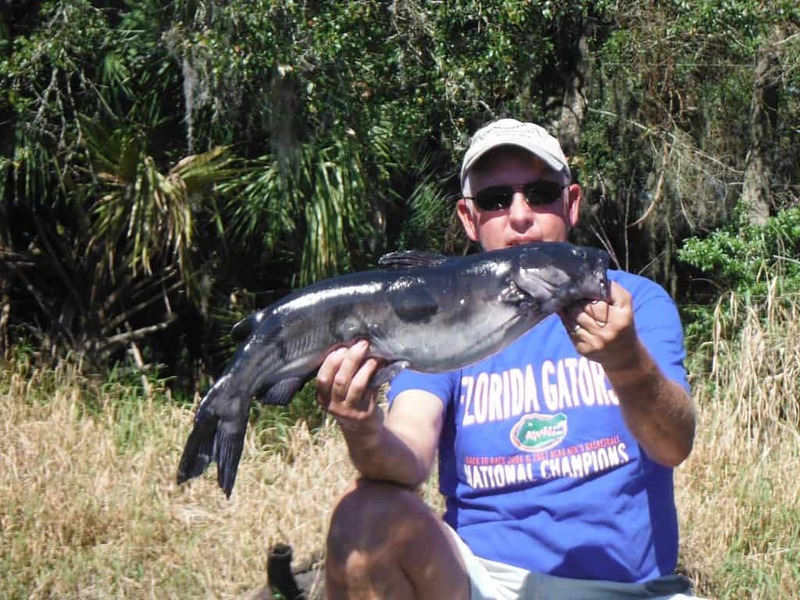 Both the Myakka and Manatee rivers also hold some nice catfish. They are also easier to locate in rivers. Outside bends in the rivers with deep holes and structure are almost a sure bet for catfish. Fishing on the bottom with live or cut bait is productive. Fly fisherman are not to be left out, either. A 3wt to 4wt outfit is perfect for bluegill, while an 8wt outfit is better when targeting largemouth bass. Floating lines and short leaders make for easy fly fishing. Short casts are the norm. Small poppers, Wooly Buggers, and tiny bait fish imitations work well on bream. Largemouth bass will hit similar flies, though in larger patterns. Deceiver flies in “bluegill” pattern works quite well. Anglers fly fishing for snook in the rivers should choose a 9 wt outfit. An intermediate sink tip line is best as the fly needs to get down in the current. Weighted flies such as the Clouser Minnow are a proven snook fly. Gold and black along with “Firetiger” are good color patterns. In closing, there are many options for anglers going out on Sarasota fishing charters. 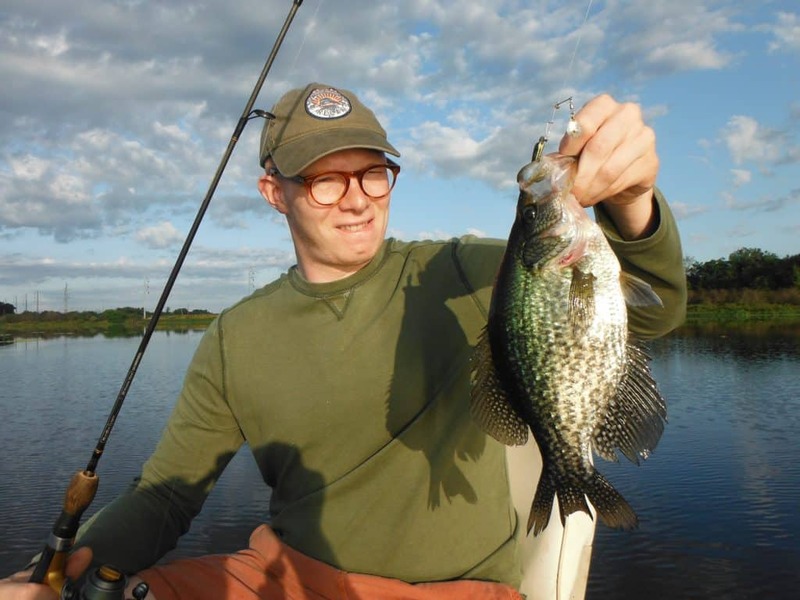 Sarasota freshwater fishing is a great option for clients seeking a different experience. Unfortunately, red tide has moved into Sarasota. Red tide is an algae bloom that suffocates fish and other wildlife. Sarasota red tide fishing can be tough. An article on tactics and strategies for fishing under these conditions follows my weekly report. Clients on Sarasota fishing charters had success this week, despite the emergence of red tide. The key was to find unaffected areas. The middle of Sarasota Bay from the Moorings to Long Bar was clean and held fish. Speckled trout, bluefish, ladyfish, jack crevelle, mangrove snapper, gag grouper, catfish, and other species were landed. Bishop’s Pt. And Buttonwood were the top spots. Gulp Shrimp and Bass Assassin Sea Shad baits were productive, as was live shrimp. We did have a pretty cool thing happen on Friday morning. My clients and I were drifting the flat at Bishop’s Pt. When we noticed something odd. A dark spot appeared, then the water went crazy! It turned out to be a large school of jack crevelle. We landed several before they moved on, great sport on light tackle! Red tide is typically worse near the passes and this is the case right now. Red tide usually blooms out in the Gulf of Mexico and then gets into the bays via the passes. Unfortunately, a lot of my favorite fishing spots are near the passes. Also, I catch most of my bait on the shallow flats and bars near the passes, and the red tide has caused that bait to move. The key to finding angling success when red tide is present is to locate unaffected areas. This means anglers need to fish hard and move around. One frustrating aspect is how areas can change over night. A productive area can get an influx of red tide that evening and shut down the spot completely. Another issue that can be difficult is finding bait fish and keeping them alive. A red tide, or harmful algae bloom, is a higher-than-normal concentration of a microscopic alga (plantlike organism). In Florida and the Gulf of Mexico, the species that causes most red tides is Karenia brevis, often abbreviated as K. brevis. To distinguish K. brevis blooms from red tides caused by other species of algae, researchers in Florida call the former the “Florida red tide.” More red tide questions and answers can be found HERE. Red tide has been documented for centuries. It gets it’s name by changing the water to a red or brown color. Here in Sarasota, it looks a bit like orange juice. It can cause skin irritations and respiratory issues in humans. It can kill fish and other marine life. Many people say they can “smell” the red tide. In actuality, they are smelling the decaying fish. The Florida Wildlife Commission has a very informative and detailed web site. Anglers can get information on red tide and can sign up for e-mail updates on red tide and policy and law changes. HERE is their map of the current red tide status. As previously stated, the key to achieving angling success when red tide is present is finding “clean” water. Water affected by red tide will have a brown hue. Unaffected water will have that nice “green” color. The presence of dead fish floating can be tricky. Some of the dead fish could be from many miles away. Still, it is not very pleasing to fish near dead, stinking fish. Fishing with live bait can be frustrating during red tide blooms. Anglers can spend an hour loading up the well, only to drive through a little patch and have it all die. This can be true during times where the red tide is present but not strong. Bait will be bunched up and easy to catch, but as soon as it is concentrated in the well, it struggles. This is obvious as the bait “spins”, tries to jump out, or sinks down to the bottom to die. Shrimp are much less affected by the red tide. Shrimp are purchased at local bait shops and are usually easy to keep alive. This makes them a better choice under these conditions in many instances. Artificial lures are a good option when red tide is present. There are several reasons for this. Lures allow anglers to cover a lot of water. This meant that unproductive water can be eliminated in a reasonable amount of time. My personal favorite lure in the lead head jig and grub combination. A ¼ ounce jig head with a 4” Bass Assassin Sea Shad tail or a 3” Gulp Shrimp work very well. Silver spoons cast a long way and can be a good “search” bait as well. Suspending and diving plugs can be cast or trolled to locate fish. One thing that red tide can do is concentrate fish. If half on the area is affected by red tide and half is not, obviously the fish will move into the areas with better water quality. Again, don’t stay in one spot too long if it does not produce. There will not always be obvious signs that the algae bloom is present. Another result of a red tide outbreak is that some species will be found in unusual places. Fish species such as bluefish and Spanish mackerel might be located in backwater creeks. Inshore Gulf of Mexico species may move inshore. They are simply trying to escape the death that will come if they stay in the poor quality water. I remember one charter a few years ago. I was able to catch a few pilchards and keep them alive. We were anchored up on a mangrove shoreline that had been producing a few snook. My clients hook a fish which made a hard run. It turned out to be a spade fish, a species I had never caught in Sarasota Bay! On another trip we were casting Rapala plugs in Phillippi Creek. This is a fairly brackish area. We found a school of big bluefish in there. Again, I have never caught one in there before or since. Fishing with live bait fish can be frustrating when red tide is present in the water. On several occasions I have had a well full of great baits die after driving through a patch of the deadly bloom. I have had other trips where as soon as I anchored up to chum, the bait began to act oddly. Bait affected by red tide with “spin up”, swimming around in circles and trying to leap out of the well. When this happens, I pull the anchor and crank up the motor as quickly as possible. As long as some of the bait lives, all is not lost. The dead baits can be used effectively as chum at another spot. But, clean water needs to be located before this can happen. Once a spot that the bait will stay alive in is found, the dead bait can be used as chum and the live ones used to catch the game fish. While I focus primarily on fishing inshore, offshore anglers are not immune from red tide issues. Patches of red tide can exist from the beach out many miles. The same strategy of finding clean water applies there as well. Also, keeping bait alive is a problem as well. One little area of affected water can kill dozens of great baits in short order. Clients often ask me if fish are safe to eat during outbreaks of red tide. The answer is “yes”! Fish are safe to eat as long as they are healthy when caught and put on ice. However, all fish should be filleted! This will eliminate any chance for ingesting toxins that might be in the entrails. Shellfish should NOT be eaten during red tide conditions! Commercially caught shellfish are regulated and are safe to eat. While it is also usually safe to swim when red tide is present, it can cause eye and skin irritations, so maybe best to stay out of the water until it clears up. It comes as a surprise to many visiting anglers that artificial lures can, at times, out fish live baits. As a full-time fishing guide in Sarasota, being flexible in adapting to conditions is critical to success. I use artificial lures very often on my charters, especially in the cooler months. Here is my list of the best 6 Sarasota fishing lures. My 6 best Sarasota fishing lures are as follows; Bass Assassin jig and grub, Rapala X-Rap, Gulp Shrimp, Johnson spoon, MirrOlure Mirrodine, and Key Largo pompano jig. These are all lures that have proven themselves over the years for my clients on my Sarasota fishing charters. These lures cover the entire water column, from the surface to the bottom. They can also be fished as shallow as a foot up to the deepest water in Big Pass. Artificial lures are effective for a number of reasons. While live bait primarily produces when fish are hungry, lures will elicit strikes under other conditions. Fish will hit lures out of anger, competitiveness, excitement, or curiosity. A lure can be used to aggravate efficient abiding that is something a live bait won’t do. This makes artificial lures effective when fish are both actively feeding and in a more challenging mood. Artificial baits allow anglers to cover a lot more water than live baits. This is crucial to success when fish are scattered over a large area. Many of the best deep grass flats are large areas. Lures are usually the best option to eliminate unproductive water as quickly and efficiently as possible. Artificial lures are also a lot of fun to fish. They are a bit more interactive and many anglers get more satisfaction out of fooling a fish on “fake” baits. The most popular and effective artificial lure on the West Coast of Florida, and really the entire Gulf Coast, is the jig and grub combo. Jigs are inexpensive, easy to use, and effective on a wide variety of species. They can be set up to mimic bait fish or crustaceans. The single hook on a jig also allows for a less invasive release of the fish. My personal favorite soft plastic bait is the Bass Assassin line of baits. They offer jig heads in several different styles with long shank hooks, wide gap hooks, and different head sizes and colors. The 4 inch Sea Shad tail works very well for me here in Sarasota. Colors are endless, with my favorites being Red Gold Shiner, New Penny, and glow chartreuse. Jig heads come in a wide variety of sizes styles and colors. Despite that, they are all basically the same. A jig head is basically a hook with a lead weight at the front near the eye. This design allows for some weight to be cast out easily. It also gives the jig a seductive, erratic motion in the water. The most widely used jig size here in Sarasota is a 1/4 ounce. Anglers fishing shallow water will need to go down to a 1/8 or even a 1/16 ounce jig head. Conversely, anglers fishing deeper water or in heavier current may need to bump up the jig weight to 3/8 ounce or even a 1/2 ounce in extreme conditions. Bass Assassin Sea Shad baits are very easy to use. They can be cast out and retrieved at a steady pace. But, the more effective retrieve is a jig and fall retrieve. The jig is cast out, allowed to sink several seconds, then the rod tip twitched sharply. The jig is then allowed to fall, seemingly helpless. This is the action that triggers most strikes, therefore most strikes occur on the fall. They are effective in almost every angling application. The deep grass flats, passes, backwaters for snook and redfish, and inshore Gulf of Mexico when fish are breaking are all situations in which the Bass assassin 4 inch see Shad is an effective bait. Plugs have been around freshwater and saltwater fishing for a long time. In freshwater, they are used to mimic a variety of different types of prey. Here in Florida, the primary use is to imitate a wounded bait fish. They do that very effectively! Plugs can be cast a long way and are great to cover a lot of water in a reasonable amount of time. They also elicit some very exciting strikes. One negative of fishing with plugs is the treble hooks. However, several manufacturers, including Rapala, are offering plugs with a single wide gap hook. My favorite plug is the Rapala X-Rap Slash bait in the number eight size. This slender bait is several inches long and mimics the size, shape, and color of the bait fish that are prevalent in the area. Olive is a very good producer in water that has a little color to it. Ghost is a fantastic color in very clear water and out in the inshore Gulf of Mexico. Rapala X-Raps work very well trolled out in the Gulf of Mexico as well as in Sarasota Bay. These small plugs have produced many nice catches for clients on my Sarasota fishing charters. They are fairly easy to use, with a great built in action. They float on the surface, then dive down a couple feet when retrieved. X-Raps have a great erratic action that triggers some vicious strikes. Rapala plugs are effective in a wide range of angling applications. I use them a lot when targeting snook, redfish, and jacks around oyster bars, mangrove shorelines, and docks. They work very well when trolled in rivers, creeks, and residential canals in the winter. Rapala X-Raps are great fun whenever fish are breaking on the surface. This definitely includes inshore Gulf of Mexico action for Spanish mackerel and false albacore. They are also extremely effective when cast over shallow grass flats that have bait working on them. The best retrieve when using these plugs is a twitch and pause. The lure is cast out, retrieve quickly for a few feet, then allowed to pause. 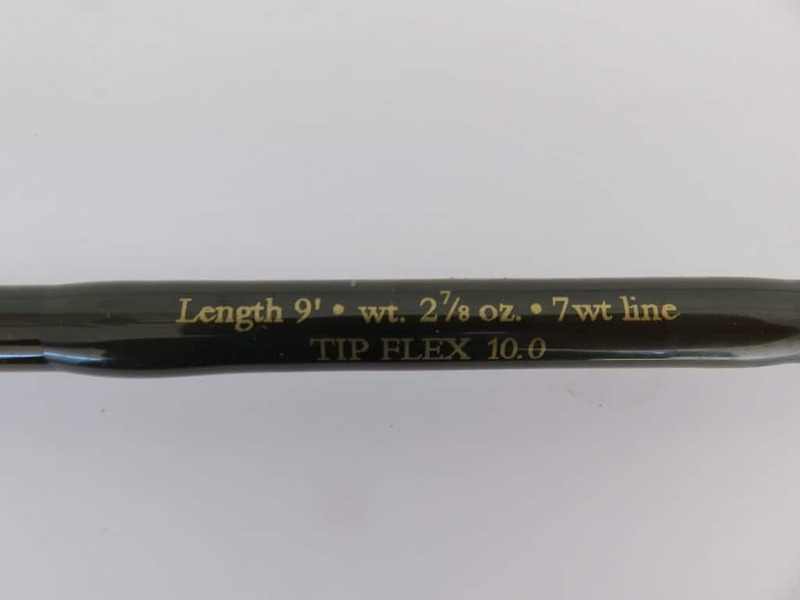 Short twitches of the rod tip will impart a darting action. Often times, the strike occurs as the bait sits there motionless. Care does need to be taken when using plugs, especially with multiple anglers on the boat. Treble hooks can be dangerous both when casting and releasing fish. There are times when the bite can be slow, and this is when I switch to scented grubs. The best one by far, in my opinion, is the Gulp line of baits. Gulp Shrimp in the 3 inch size work very well, in some cases better than a live shrimp. These baits can be extremely productive, especially for speckled trout when conditions are a bit tough. The formula that was created for the gulp shrimp is very effective. It is more than just a soft plastic immersed in a scent. The scent is actually built into the bait itself. In all honesty, color matters very little, in my opinion. It is all about the scent! As with other baits, they come in many different sizes, shapes, and colors. The 3 inch shrimp is the most effective size here in Sarasota. Glow, root beer, and new penny are the top colors. Gulp Shrimp can be used just like any other soft plastic, rigged on a quarter ounce jig head. Anglers will usually have a bit more success with the Gulp Shrimp working them a bit slower. As stated, the sent is the primary attraction, so the bait should be work just above the grass or bottom in a subtle hopping motion. They can even be brought back in using a steady retrieve, just above the grass. Another popular way to use a Gulp Shrimp is under a noisy cork. This is very popular in Louisiana and Texas. Noisy floats such as the Cajun Thunder have a concave face which gives off a distinct popping sound when twitched. A 2 foot to 3 foot leader is tied to the bottom of the cork, followed by a 1/8 ounce jig head. The gulp shrimp is then added to the jig head hook. The rig is cast out, allowed the settle, and worked back in a series of aggressive twitches. In most cases, the more noise the better! This is just like using a live shrimp under a popping cork, and can be just as effective. Johnson spoons have been around a long time, originating as a freshwater bass lure. The spoon was designed to work through lily pads and other freshwater vegetation without hanging up. The 1/2 ounce gold weedless Johnson spoon is a mainstay of redfish anglers all over the country. They can be cast a very long way and worked through shallow grass without snagging the bottom. They have a single hook which rides upper right allowing for good hook sets without catching on the grass. There are two attributes of the Johnson weedless spoon that make it so effective. They have the ability to run very shallow while still given off a wobbling, seductive action and the ability to cover a lot of water in a short amount of time. Redfish and snook will scatter over the shallow grass flats and stage in potholes and other areas. The Johnson spoon cast very far and this allows anglers to eliminate unproductive water efficiently. They do come in silver as well, but gold is a more effective color in the slightly stained waters where redfish and snook generally live. the 17 MR 808 MirrOlure Mirrodine is an absolutely perfect replica of one of our top baits; the scaled sardine. Also known as shiners, white bait, pilchard, and greenback, it is a primary forage of many game fish in Sarasota and throughout the entire Southeast United States. The number 18 color, green back with a white belly, is a very popular color pattern. As with all manufacturers, MirrOlure offers many different sizes and colors, but this particular pattern works extremely well here in Sarasota. The MirrOlure Mirrodine is a suspending twitch bait. It does not have a bill as do many plugs. It has a more subtle action which at times is extremely effective. The lure sinks very slowly and is retrieved back using short twitches with a pause in between. The bait suspends, hanging there motionless, an action which drives fish crazy. This bait is most effective and water 5 feet deep or less. It is deadly when fished over bars on a high tide. Pompano jigs are very plain looking. This belies the fact that they are very effective artificial baits. Pompano jigs have a round fairly heavy head with a short, smallish hook and some dressing. This dressing is usually nylon and extends just beyond the bend of the hook. The 1/4 ounce Key Largo pompano jig works very well, and is quite economical. Chartreuse and white are the two most popular colors. Pompano jigs are simple and easy to use. They are extremely effective in the passes where they are fished vertically. The angler simply drops the jig down to the bottom and is hopped as the boat drifts along. These baits imitate small crabs and shrimp that live near the bottom. Each time the jig is lifted and falls it kicks up a little puff of sand. This is very natural and will fool pompano, ladyfish, and other species in the passes. The Key Largo pompano jig can also be used effectively on the deep grass flats. There will be some days where the fish actually prefer the smaller profile especially in the cooler weather. It is especially effective over flats that have a mottled bottom with areas of sand interspersed with the grass. 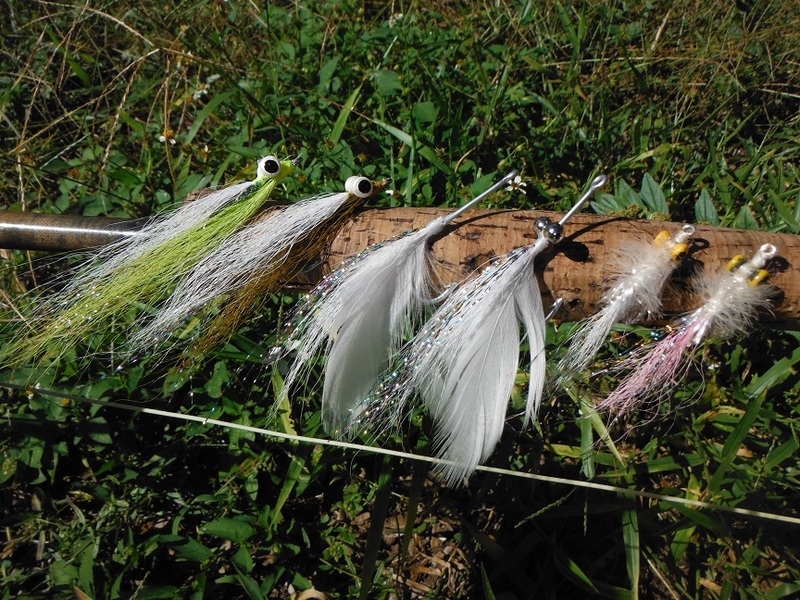 These jigs generally will not catch as many speckled trout as the jig and grub combo well, however it catches everything else and will catch more Pompano. Pompano jigs work very well for anglers fishing off of the beach. Anglers can “tip the jig” by adding a small piece of shrimp to the hook. This is an effective method used to catch whiting, silver trout, and other species out of the surf, especially in the cooler months. I hope the list of my best 6 Sarasota fishing lures was informative and helps anglers catch more fish!